A proposal serves as the act of persuasion or consideration to the desired party. Sending an attractive proposal is an art. This expertise of sending an appealing proposal comes with a good market knowledge as well as customer needs and desire. The opening and closing of proposals need to be accurate and to-the-point. This works well for a prompt response. In today’s competitive market, launching a product is quite complex. It is complex is such a way that people usually go for familiar products which they are using since times. It is quite challenging to divert the customer’s mind to get attracted to the new product. 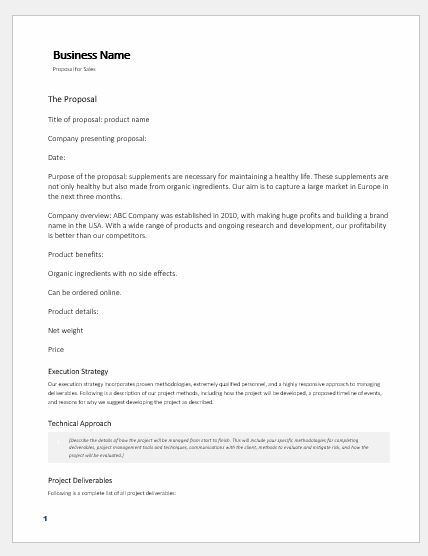 A product proposal is proposed for a new product or an existing product i.e. the new product for existing customers and the existing product for the new customers. The product proposal must be customized with the theme. The theme is helpful in giving a reason for buying the product. An effective product proposal helps in building attraction for the customer. Secondly, it must contain the exact details and benefits of the product. Thirdly, additional benefits must be added to the proposal. The market trend summary can be added to the proposal. It creates an influential image in the eyes of the customer about the product genuinely. The product proposal letter should be addressed to the exact bodies. It should be impressive and informative. The information must be authentic as nowadays the customers have sharp knowledge of most of the products. Additionally, it must be to the point. Product proposal is a way to sell the products to new as well as the existing customers. In such instances, a customer can be the agents as well as the distributors. We are living in a day and age of a lot of information. The information we get can make or break our decision. So, it is very important to write an effective product proposal. Before writing a product proposal, the focus should be on the product which will help to create more sales. Mentioning the advantages and benefits of the product is the key to any proposal. Not just the perks of the product, it is also worth noting to mention the different ways the product can ease the life of your customer. Purpose of the proposal: supplements are necessary for maintaining a healthy life. These supplements are not only healthy but also made from organic ingredients. Our aim is to capture a large market in Europe in the next three months. Company overview: ABC Company was established in 2010, with making huge profits and building a brand name in the USA. With a wide range of products and ongoing research and development, our profitability is better than our competitors. Organic ingredients with no side effects.